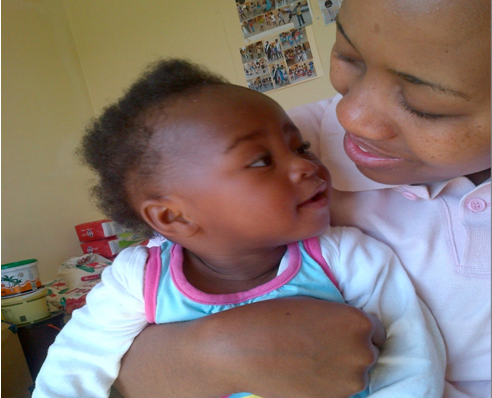 Constance and one of the clients who attends day care at the centre. My name is Constance Mpolokeng Tohlang, I am 27 years old. I am the eldest to my one and only brother. My father passed away when I was 12 years old leaving us very vulnerable. We used to stay at a lovely home my father bought for his family, when he passed away he was not yet done paying it because he was still young. My mother was not working at the time and we had no means of income. We were forced to go and live at a squatter camp with shacks. Life changed completely and became more difficult for me and my family. My mother became a helper for people in order to put bread on the table for me and my brother. Sometimes family members would contribute to assist us. Through the grace of God we never went to bed hungry or walked barefoot. Three years later my mother got very ill and would still go to work ill as she was just to provide for us. During her long illness she was diagnosed with HIV/AIDS and tuberculosis. This was a very stressful situation for my brother and me but we always had hope that one day everything will go well. She had to be on medication the same time because she could die. As a Social Auxiliary Worker at Klipkop my responsibility is to assist with admistration, planning of programmes like gardening, daily activities, year plans, evaluations, statistics and assisting with applications for getting funds. I do basic counseling, budgeting, mediation between families, and provide spiritual support. I am responsible for conducting HIV/Aids support groups, life skills groups with children, and other group work according to the need. I conduct meetings (parent’s meetings, caregivers, and community) do casework, and refer clients to social service agencies. All my effort is geared towards the development of our community. Together as a family we trusted that God would always make a way. I went to school with the hope that one day life would get better and knowing well that without education my life will be more complicated. After completing my matric I never had money to further my studies. Instead of staying at home I decided to go and devote my time in helping other people who needed help like me at Etelang Pele.